Things are getting a little tense in my little study cave! As the date approaches I am getting more and more stir-crazy. I still have “a lot of time” but the more I learn, the less I feel I know. 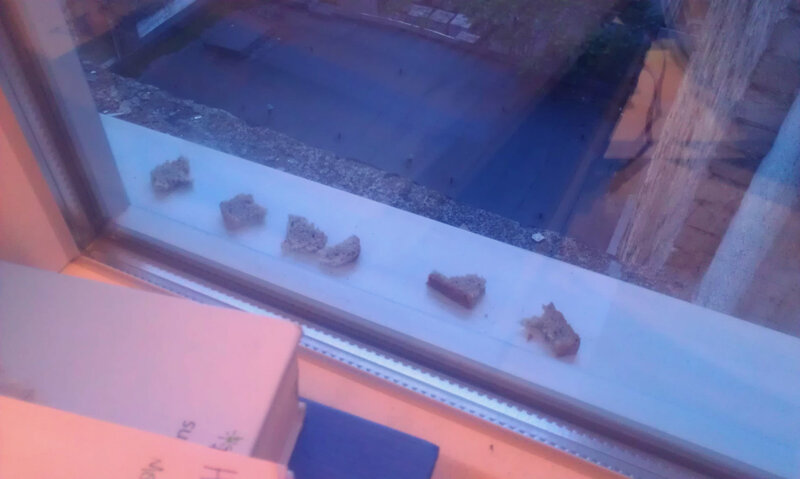 and I’m finding weird ways to keep myself entertained…like baiting birds with bread on the windowsill. No takers yet…but I’m still hopeful. In more exciting news, I left the apartment yesterday! And for several hours! Jannie had her anatomy exam (which went well) so I walked with her to school and quized her along the way. 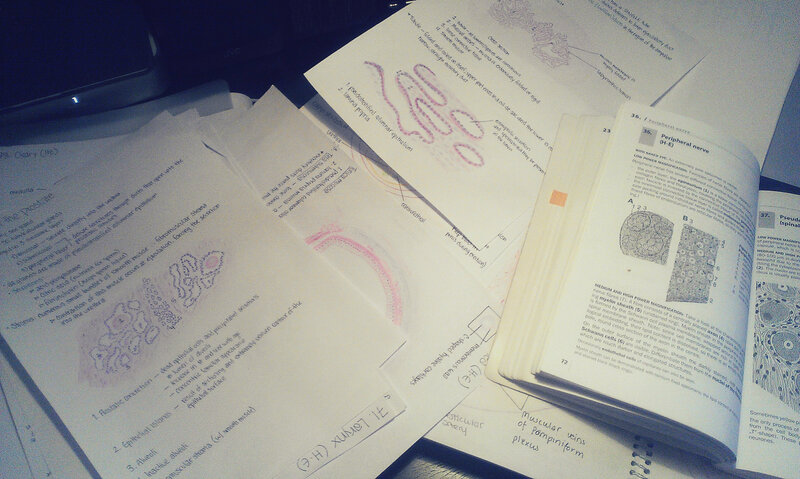 While she was doing her exam, I went up to the anatomy consultation. I was one of the first ones there, so I was lucky enough to get a whole cadaver to myself for an hour. I spent a little bit of time reviewing the urogenital system and then refreshed a bit of my gastrointestinal knowledge. After a while, some other students from my faculty arrived and we spent maybe an hour or so testing each other on various structures. 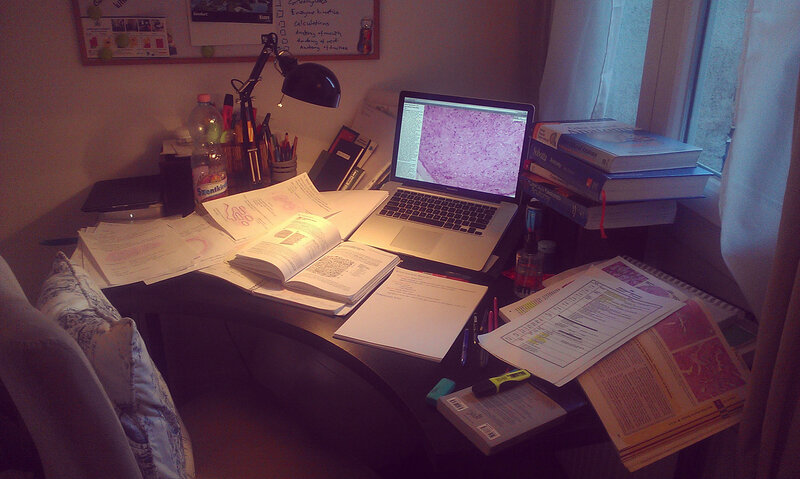 Christian (from my group, not my younger brother) and I made plans to test each other on Monday at both the histology and anatomy consultations. We’ve sort of paired off in anatomy already and I’ve learned so much when we’ve tested each other during the practicals. After Jannie was done with her exam we started the walk home and then decided to grab some lunch…and a celebratory glass of wine! It was really, really nice to check out of my cave for a little bit. I felt like I got a little refresh in the midst of all this study chaos. Once we were finished, I headed back home to my study spot and studied until a little past midnight. Keep going! – you’re almost there! Thanks! Yes, I love that one 🙂 We have it written on the whiteboard above the desk where I am studying. It seemed like the perfect fit. You are currently reading The virtue lies in the struggle, not in the prize at Buda-B.